so why dont you kill me? It's not often that a song is able to sum up a piece of art in totality, but this would be that one occurence. The only thing I could possibly add about Chuck Agro's fantastic simian offering is that he must be the be-all-and-end-all hero to Christopher "Chris" Cross, the truly hopeless son on Seth MacFarlane's brilliantly written "Family Guy." Espousing absolutely no direction, and certainly no clue, Agro is able with a single brushstroke to capture the essence of skaterpunk.alt.country.indie.death.rap.kuntry.thrash.krunk.punk.metalhead.emo.posuer culture and throw it back at us with an empty-eyed essence, leaving me satisfied and full. Not only did Agro have the funniest piece in all of Scope, but the friendliest and most genuine dealer in Cynthia Broan. Broan appeared to genuinely care about getting to know each of her visitors and took the time out of a very busy day to chat my friend and I about Agro and some of her other roster. 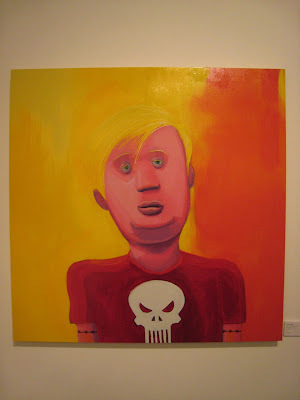 Next week I'll highlight the current show at her 29th Street Gallery, "What F Word?" but for now, let's just say meeting her was one of the biggest delights of my Scope Sunday. Speaking of "big delights," this posting today is doing most of the work for me with my photos. 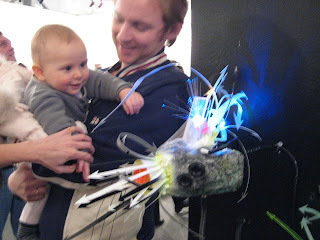 I mentioned yesterday that nothing is more pure than art through the eyes of a child. Who says iPods are toys only for grown-ups? 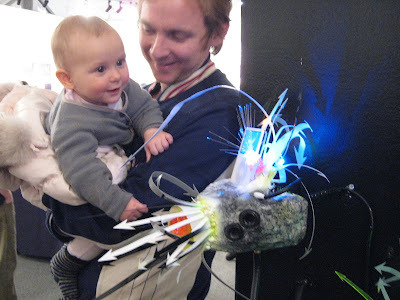 This baby girl spent minutes mesmerized by dNASAb's "iPod Ecosystems" exhibit. The setup is a hardware video synthesizer with fiberoptic components that vibrate and move to the music. It's not necessarily music, per se, but it operates on pure energy. Mr. or Ms.?? NasaB is able to give us a nice commentary on how technology has taken over our lives in marginal increments and is now ingrained in us as much as the telephone. I think of an iPod forest with dragonflies fluttering about-- landing on lillypads, dancing about to the newest download. Very innovative and certainly strange at the same time. I wanted to almost pet the creations myself-- it definitely has a "reach out and touch" vibe to it. A great piece of work, as well as colorful. It also shows me how much design plays in marketing concepts-- if something can hold the attention of a baby so ingeniusly... well, it must be ingrained in us from birth to like shiny new things. Looks like we're victims of consumerism from cradle to the grave. Moving on to something with about as many appendages as dNASAb's creations is the work of Scope Miami's 2006 Emerging Artist Grant recipient Tomas Rivas. Rivas' work is lovingly crafted by carving out pieces of drywall. Here you're able to see the decorative arts mix alongside elements of Ancient Greece and Rome. I like how each sculpted piece has a floral touch; almost hibiscus-like in its ornamentation. It also reminds me of the works of legendary coutouriers such as Christian LaCroix, or Gianni Versace's early goddess gowns of the '90s. Maybe I still have ingrained in memory the Annie Liebovitz photo of Nicole Kidman under the stage spotlights posing in that gorgeous white ostrich feather gown-- but there is true glamour in this work, not just odes to Corinthian, Doric and Ionic columns. Rivas is dutifully represented by Douz and Mille Gallery from Bethesda, Maryland. Finally, for this go around, (keeping on the multiple limb theme) comes the horrifying octopi-like work of Chakaia Booker, represented by West 57th's Street's Marlborough Gallery. I'm usually not one to like art that is made through "recycled means." Each appendage is a nightmarish vision-- I'm reminded of the creatures from "The Matrix," with their spiderlike arms on the attack; or perhaps the alien from "Alien" on its way to devour a new host from the inside-out. Creepy, and very ably constructed by Booker. It's one thing to learn how to bend metal and clay into formations representing the subconscious, but rubber tires must be a whole other ballgame. The ladies who lunch on 57th Street must run screaming into the night (or at least Bergdorf's) at sight of this.